In thousands of installations worldwide, DeZURIK Eccentric Plug Valves have a proven record of long-term reliability. Originally, the DeZURIK Eccentric Plug Valve was developed by Matt DeZurik in 1928. A wide variety of value-added design features and unmatched economy have made it the preferred choice of engineering, operations and maintenance personnel. DeZURIK Eccentric Plug Valves are used in water, wastewater treatment plants, power, chemical plants and paper mills. Sizes .5–3" (15–80mm) Eccentric Plug Valves feature a plug with upper and lower shaft in a one-piece casting. The straight plug face allows for inherent linear flow characteristic. The plug rotates completely out of flow, allowing high, straight-through flow capacity. Because the plug is out of the flow path, it provides increased plug life in abrasive applications. All .5–3" (15–80mm) valves are available with a variety of resilient plug facings suitable for temperatures up to 450º F (232º C). Resilientfaced plugs provide dead-tight shutoff without the use of sealing lubricants. Even if small solids are trapped between the plug and seat, the resilient facing provides tight shutoff and prevents seat damage. provides drip-tight shutoff on wet-service applications up to the full pressure rating of the valve with pressure in either direction. Materials available include chloroprene (CR), acrylonitrilebutadiene (NBR), hard natural rubber (NRH), chloro-isobutene isoprene (CIIR), hard rubber with chloroprene overlay (NRCR), chloro-sulfonyl polyethylene (CSM) and fluoro rubber (FKM). All-metal plugs are also available for hightemperature or throttling applications where dead-tight shutoff is not required. All .5–3" (15–80mm) valves have a rugged, one-piece bolted bonnet for maximum strength. It houses upper bearing and shaft seals to increase cycle life. If maintenance is ever required, its easy disassembly allows access to internal components. Heavy-duty bearings resist corrosion to prevent binding and assure lasting easy valve operation without lubrication. These rugged stainless steel bearings are furnished in the bonnet and body of all valves. A variety of stem-seal materials provides maintenance-free sealing that matches valve performance and ensures long life and reliability. DeZURIK offers the most complete line of eccentric body materials to meet the requirements of a broad range of applications up to 285 psi (1965 kPa). Materials available include cast iron, acidresistant bronze, carbon steel, stainless steel, Alloy 20, Monel and Hastelloy C.
Clean interior design and straight-through flow allow high maximum capacity with minimum pressure drop. A complete choice of end styles includes threaded to ANSI Class 150, DIN, BS or JIS standards; flange-drilled to ANSI Class 125/150 standards; mechanical joint (3" only); and grooved per AWWA C606 Table 2, 3 or 4. The mounting pad on Eccentric Plug Valves is compatible with standard DeZURIK actuators. The ISO bolt pattern allows standardization of actuators on a variety of DeZURIK valves, reducing inventory. Cylinder and Compact actuators can be mounted to the valve. A wide range of manual actuators, including manual worm-gear handwheels, chainwheels, square nut drives and levers may also be ordered. DeZURIK eccentric action and resilient plug facings ensure lasting dead-tight shutoff. As the eccentric plug rotates 90º from open to closed, it moves into a raised eccentric seat. In the open position, the segmented plug is out of the flow path. Flow is straight through, allowing high flow capacity. As the plug closes, it moves toward the seat without scraping the seat or body walls, so there is no plug binding or wear. 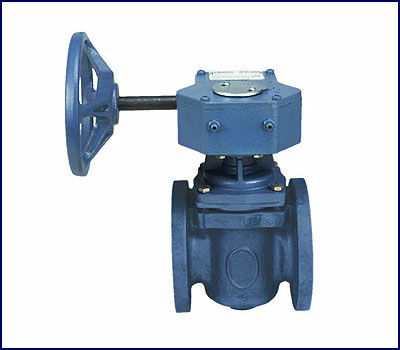 Flow is still straight through, making the throttling characteristic of this valve ideal for gases, liquids and slurries. In the closed position, the plug makes contact with the seat. When furnished with a resilient facing, the plug is pressed firmly into the seat for dead-tight shutoff. Eccentric plug and seat design ensure lasting shutoff, because the plug continues to be pressed against the seat until firm contact is made. DeZURIK Eccentric Plug Valve provides excellent throttling control and accuracy. Permanently lubricated bearings and eccentric action reduces stiction, allowing for small incremental and controllable steps. The one-piece cast plug and shaft effectively eliminates mechanical backlash and hysteresis. In addition, the firm coupling connecting the valve to the actuator increases measurable accuracy.